ابیض, علی, افرا, الیاس, شاه حیدر, نرجس, محمدی, نصیبه. (1397). انرژی های تجدیدپذیر، منبع پایدار تامین سوخت جایگزین در محافظت از عرصه های ‏منابع طبیعی. دو فصلنامه انرژی های تجدیدپذیر و نو, 5(2), 84-89. علی ابیض; الیاس افرا; نرجس شاه حیدر; نصیبه محمدی. "انرژی های تجدیدپذیر، منبع پایدار تامین سوخت جایگزین در محافظت از عرصه های ‏منابع طبیعی". 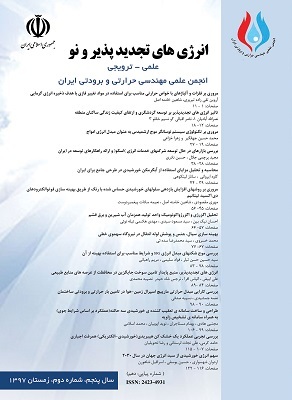 دو فصلنامه انرژی های تجدیدپذیر و نو, 5, 2, 1397, 84-89. ابیض, علی, افرا, الیاس, شاه حیدر, نرجس, محمدی, نصیبه. (1397). 'انرژی های تجدیدپذیر، منبع پایدار تامین سوخت جایگزین در محافظت از عرصه های ‏منابع طبیعی', دو فصلنامه انرژی های تجدیدپذیر و نو, 5(2), pp. 84-89. ابیض, علی, افرا, الیاس, شاه حیدر, نرجس, محمدی, نصیبه. انرژی های تجدیدپذیر، منبع پایدار تامین سوخت جایگزین در محافظت از عرصه های ‏منابع طبیعی. دو فصلنامه انرژی های تجدیدپذیر و نو, 1397; 5(2): 84-89. L.P., Lombard, J., Ortiz, C., Pout. A review on buildings energy consumption information. Energy and Buildings. Renewable and Sustainable Energy. Volume 13. 1418-1427.Volume 40. 394-398. 2008. C. B.Field, J. ElliottCampbell, D.B.Lobell. Biomass energy: the scale of the potential resource. Trends in ecology and evolution. Volume 23. 65-72. 2008. N. Neshat, M. R. Amin-Naseri and H. Shakouri Ganjavi. A GAME THEORETIC APPROACH FOR SUSTAINABLE POWER SYSTEMS PLANNING IN TRANSITION. IJE TRANSACTIONS C: Aspects. Vol. 30. 393-402. 2017. G. Francis, R. Edinger, K. Becker, A concept for simultaneous wasteland reclamation, fuel production, and socio-economic development in degraded areas in India: Need, potential and perspectives of Jatropha plantations. Natural resources forum. Volume 29. 12–24. 2005. M. SrinivasaReddy, ShaikBasha, H.V.JoshiB.Jha. Evaluation of the emission characteristics of trace metals from coal and fuel oil fired power plants and their fate during combustion. Journal of Hazardous Materials. Volume 123. 242-249. 2005. J. A.Cherni, I. Dyner, F.Henao, P. Jaramillo, R. Smith, R. OlaldeFont. Energy supply for sustainable rural livelihoods. A multi-criteria decision-support system. Energy Policy. Volume 35. 1493-1504. 2007. W.Permchart, V.I.Kouprianov. Emission performance and combustion efficiency of a conical fluidized-bed combustor firing various biomass fuels. Bioresource Technology. Volume 92. 83-91. 2004. F., Cherubini. The biorefinery concept: Using biomass instead of oil for producing energy and chemicals. Energy Conversion and Management. Volume 51. 1412-1421. 2010. G.Najafi,B.Ghobadian,T.Tavakoli,T.Yusaf. Potential of bioethanol production from agricultural wastes in Iran. 2009.